Chen JG, Yang CP, Cammer M, Horwitz SB. (2003) Gene expression and mitotic exit induced by microtubule-stabilizing drugs. Cancer Res. 63(22):7891-9. Chitu V, Pixley FJ, Macaluso F, Larson DR, Condeelis J, Yeung YG, Stanley ER. (2005) The PCH Family Member MAYP/PSTPIP2 Directly Regulates F-Actin Bundling and Enhances Filopodia Formation and Motility in Macrophages. Mol Biol Cell 16(6):2947-59. PMID: 15788569. Lorenz M, DesMarais V, Macaluso F, Singer RH, Condeelis J. (2004) Measurement of barbed ends, actin polymerization, and motility in live carcinoma cells after growth factor stimulation. Cell Motil Cytoskeleton 57(4):207-17. Lorenz M, Yamaguchi H, Wang Y, Singer RH, Condeelis J. (2004) Imaging sites of N-wasp activity in lamellipodia and invadopodia of carcinoma cells. Curr Biol. 14(8):697-703. Rodriguez-Gabin AG, Almazan G, Larocca JN. (2004) Vesicle transport in oligodendrocytes: probable role of Rab40c protein. J Neurosci Res. 76(6):758-70. Yamaguchi H, Lorenz M, Kempiak S, Sarmiento C, Coniglio S, Symons M, Segall J, Eddy R, Miki H, Takenawa T, Condeelis J. (2005) Molecular mechanisms of invadopodium formation: the role of the N-WASP-Arp2/3 complex pathway and cofilin. J Cell Biol. 168(3):441-52. Sensicam QE air cooled CCD camera; I.P. 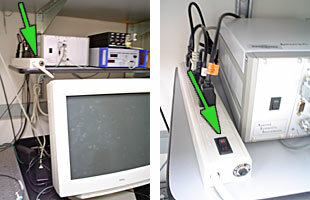 Lab Spectrum running on a PC; Sutter DG4 for excitation; ASI filter wheel for emission; alternate DualView for emission; Uniblitz shutter for transmitted; piezo for 100um travel of focus; ASI electronically controlled stage; forced air or air/CO2 heated chamber. Unlike other microscopes in the AIF, Digital Station #5 does not have a single standard configuration you can expect to find the system in every time you begin to work. 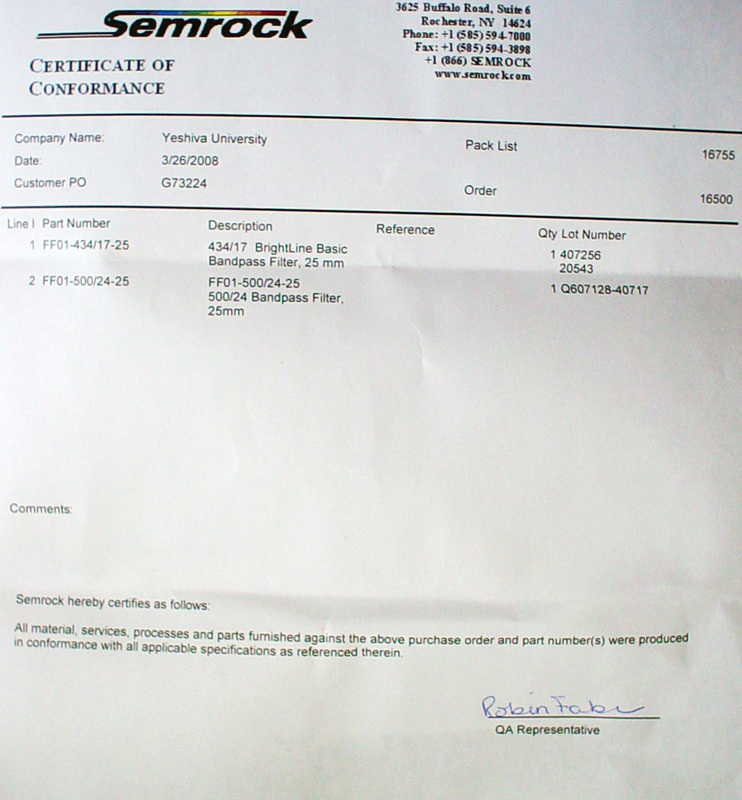 Therefore, you need to check that the instrument is configured for what you need. Before Turning On, Install the Microscope objective lens. You may not turn the microscope nosepiece to change objective lenses. The lens must be changed manually by unscrewing it and screwing in the correct objective. 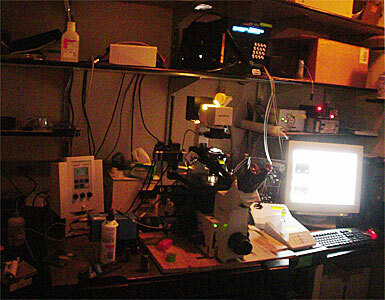 Make sure all electric power to the microscope devices is OFF before changing the objective. This is important because you do not want to break the piezo (the little box next to the objective) or the stage. Tilt the condenser back (or remove it completely). Take the stage plate off. Remove and replace the objective. Put the stage plate back in. There are metal springs in the back right corner. Push the stage plate down at an angle into the corner springs and then press the plate flat into the stage. Note that the piezo is off center. The top stage plate must be placed off center as pictured. Tilt the condenser back down (or put it back in). The microscope should always be left with a JP4 CFP/YFP filter for ratio FRET in turret position C.
Any changes in the filter blocks will be written in a table on the wall. This is the configuration as of 28 March 2008. 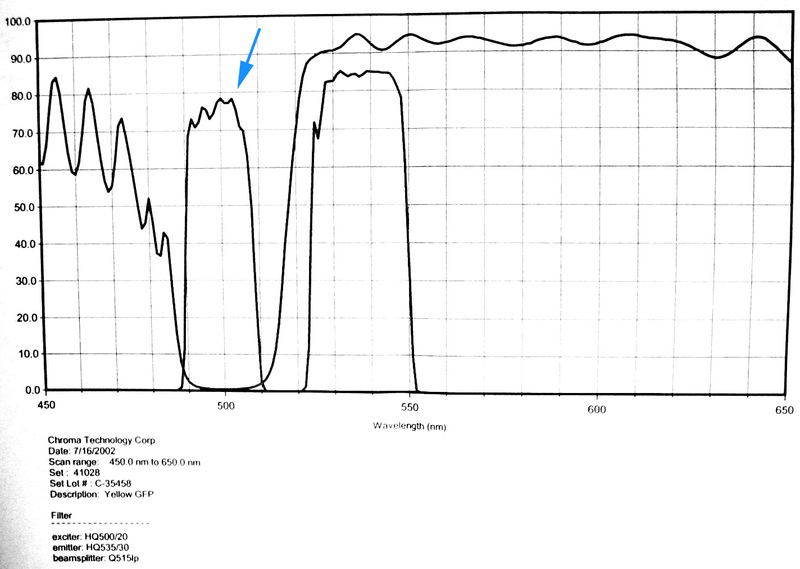 However, except for the JP4 CFP/YFP filter, this may not be the actual configuration the microscope is in! for use by eye (none) approx. 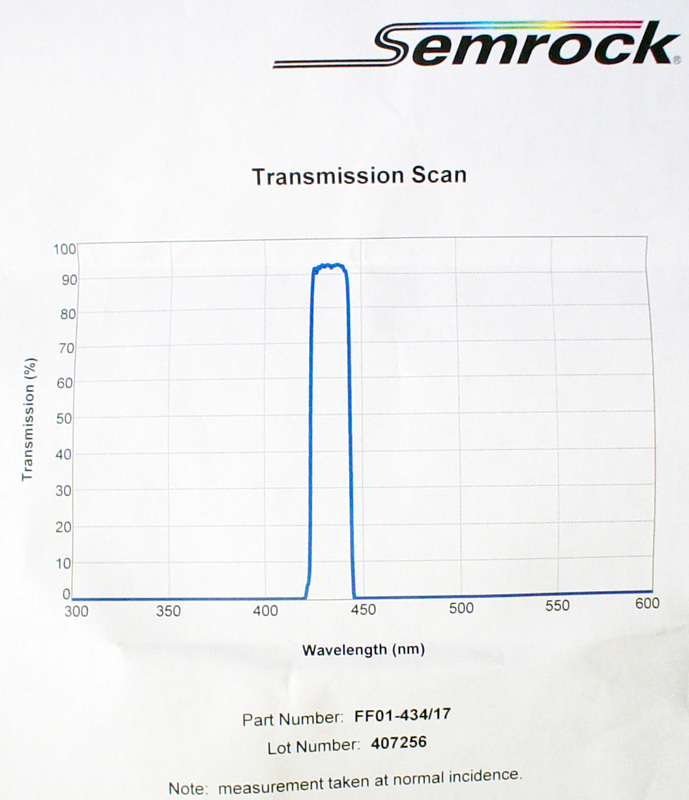 CFP/YFP dual or GFP/FITC excitation (480/40) or the filter you may swap out as needed for your use. In early 2008 maintenance on the instrument was done. The following changes have been made. Filters changed in the DG4 sliders should be labeled at the outer edge of the slider. Sutter DG4 Xenon arc lamp must go on first. The switches are on top of the unit. There is supposed to be a stepstool kept in the room so you may reach the switches. 1. Switch on left for light bulb. 2. Switch on right for electronics. Main power strip. This will send power to the external filter wheel, camera, piezo focusing device, halogen lamp for brightfield or phase contrast and the shutter for the halogen lamp. If any of these devices were turned off with their own individual power switches, you will have to turn them on before running the software. Log in and run IPLab software. A menu will pop up within IPLab asking you to Set Preferred Directory. Set the directories and then click OK. If you click Cancel, the software will not operate properly. If using bright field or phase contrast, set up microscope for Kohler illumination. To image normal full frame, the DualView unit between the microscope and camera must be set to "Full View" and have the filter blocks pulled out one click as pictured. 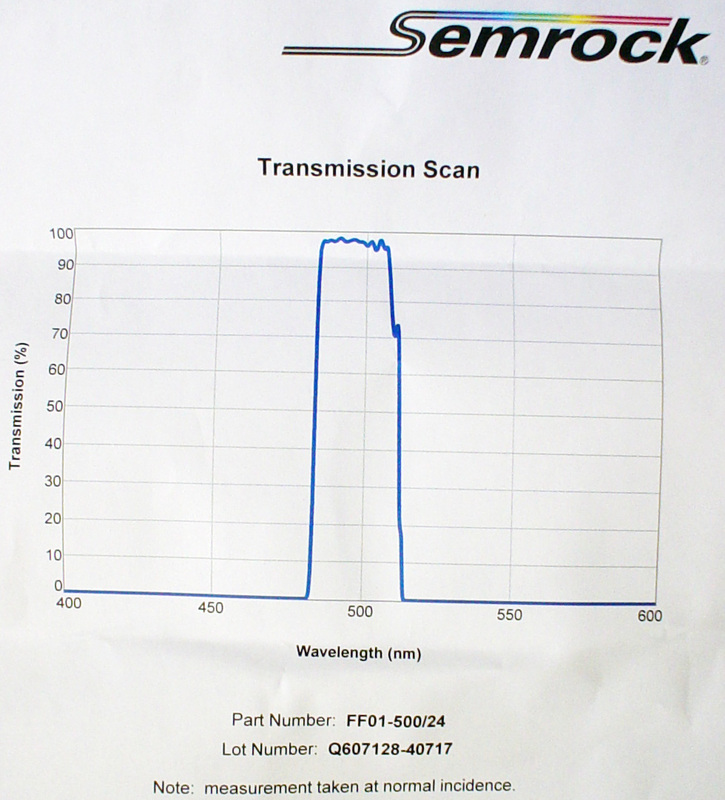 Dynamic range of the cooled CCD camera is 0 to 4095. Images are not rescaled to 0 to 65520. The function keys are clearly labeled. If you are used to using other AIF instruments, you will need to note the different function keys here. Copy all files to Reststop, some other computer out on the Internet, CD, DVD or USB memory device. Turn off one main power switch to shutters, filter wheels, etc.. If nobody is coming to use microscope within a few hours, turn off heater. If nobody is coming in with next hour or so, turn off DG4. Clean up! Oil objective should be cleaned only by dragging lens tissue lightly over the glass and careful wiping of the metal around the glass. If you changed any filters, return to original configuration. Ratio FRET on fixed material. There are scripts for automating the collection of ratio FRET images. say No to get ratio image of grid. These dual excitation and dual emission filters were removed from the 51009 F/Cy3 block for dual imaging of red and green dyes. The filter block was then installed in the microscope. To excite green or red individually, either the exciter in DG4 #2 or #4 position is activated. To image green or red individually, the correct filter position in the external ASI wheel is selected or the green/red DualView insert is used. The image is displayed on the camera as follows when the DualView and camera are in the below configuration.